West Carrollton is the new home of LB's Thumb Drive, now called Miss V. Emilee and Derek fell hard for this breed. 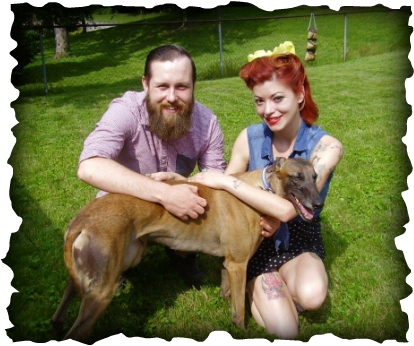 Emilee works with another GAGC adopter and after seeing so many pictures of her dogs and hearing about them, she knew a greyhound was the right choice for her and Derek. (Thanks, Mylynda!) Miss V is stunning - a very unique, almost mahogany color with that beautiful black face. We hope to see these three at upcoming GAGC events.